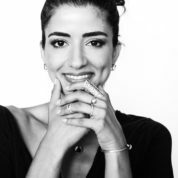 Lama Hourani is the founding principal of her eponymous jewellery line. A designer, artist and adventurist at heart; she applies her background in Product Design and multidisciplinary arts to create one-of-a-kind pieces that are not only commercially appealing but also conceptually meaningful at all scales. In 2000, Hourani launched her first jewellery collection, establishing herself as a trendsetter by making Arab heritage accessible and hip to her peers throughout the Middle East. An avid traveller, she increasingly folds various global influences and inspirations into each of her collections: Peruvian Inca symbols, Masai tribal colours, Arabian desert vernacular architectural details and prehistoric art are all blended into fine metal and gem works that bear the tale of diverse cultures. Growing up in an artistic family, who founded Foresight32, the first private art gallery in Jordan, Hourani has always been surrounded with art and inspiration. She created her first collection in the gallery’s kitchen with basic tools and one silversmith who taught her the foundations of jewellery making. Feeling that the world is divided by ethnicity and religion, she re-created prehistoric art elements and used them as a mean of expression, merging them with contemporary design elements and cultural references from all over the world. She is passionate about cultural innovation and recreating heritage through arts and design. “The most important element for success nowadays is GQ (Global Intelligence), you must be aware of the world and the diversity out there,” says Hourani. She was selected as a Young Global Leader by the World Economic Forum in 2012 for her contribution to society through art and culture. Lama is most keen on having all her production made in her Amman and Hong Kong workshops, where she trains & polishes skills. Employing people with disabilities, out sourcing to underprivileged women & empowering them financially. Imagine a world of peace, of tolerance and common values.. invest in teachers who will impact generations and help create the change you want to see in the future.